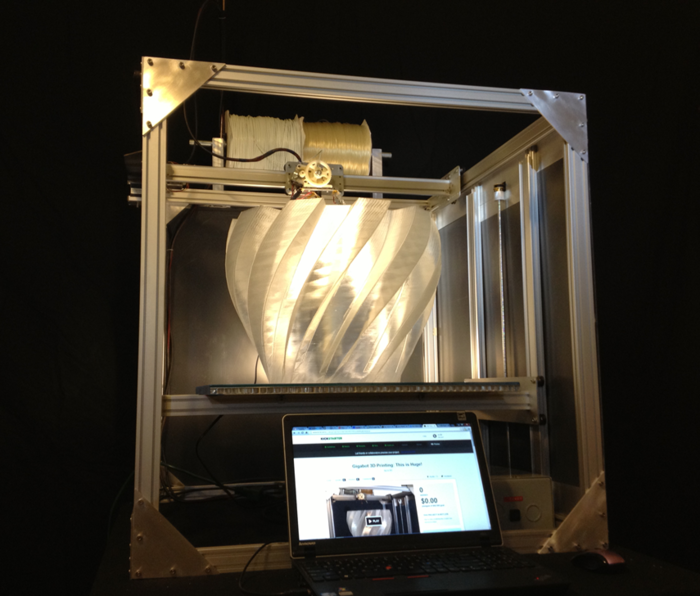 Gigabot 3D Printer Says Go Big Or Go Home | OhGizmo! The market for 3D printers is getting increasingly competitive, with entrants betting on various distinguishing features. Some aim for greater resolution while others go for low cost. The Gigabot from re:3D instead is betting that being able to print larger objects will be enough to get you to swallow its $2,750 price tag. For this sum you get a 24-cubic-inch (393 cc) build envelope (24 inches on each side, for those of you geometrically challenged), at a resolution of 100 microns, which is pretty standard. With a build envelope this large, you can print more small objects at once, or simply make bigger things than you could have with other machines. The Kickstarter campaign is fully funded, and as a matter of fact, also appears to be sold out. We’re not sure when more will be made, but considering the delivery date on these ones is in November, you better be patient if you had big printing projects in mind. Wow…. 24 inches on the side is 13,824 cubic inches. How embarrassing. Especially considering the “geometrically challenged” comment.